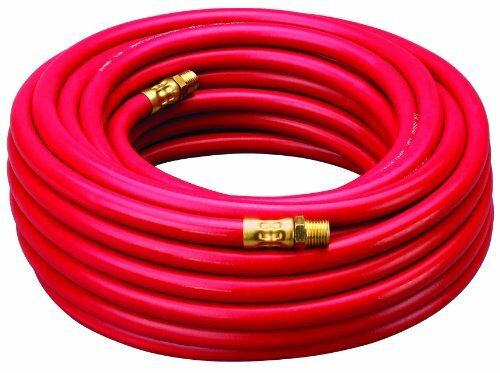 The Amflo 512-50E red rubber air hose has a 1/4" ID and is 50 ft. long. Its rubber construction provides resistance to abrasion and allows the hose to remain flexible at temperatures ranging from -20 to +165 degrees F. Its polyester yarn reinforcement provides the strength necessary to reach and maintain its maximum pressure rating of 300 pounds per square inch (psi), and it comes equipped with two 1/4" factory-installed brass male National Pipe Thread Taper (NPT) fittings. This hose is suitable for a wide range of commercial and industrial pneumatic applications. The inside diameter of the hose must be adequate to keep pressure loss to a minimum and avoid damage to the hose due to heat generation or excessive turbulence. The hose must be capable of withstanding the minimum and maximum temperatures that occur within the hose system. Some applications require specialized oils or chemicals to be conveyed through the system. In this case, hose selection must ensure compatibility of the hose tube, cover, couplings and O-rings with the fluid used. Industrial hoses are used in systems such as air compressors, automatic manufacturing operations, aircraft controls, and tire installation in industries including agriculture, mining, road construction, firefighting, and aviation. Plews & Edelmann manufactures automotive and pneumatic hose, lines, reels, accessories, fittings, and lubricants under the Edelmann, Amflo, Omega, LubriMatic, and UltraLube brands. The company, founded in 1909, is headquartered in Dixon, IL.